We tried for Hoppers on 2 consecutive Fridays. On both occasions we arrived a little after 6pm and the queue was already 3-hrs long. Seeing it's open all day on Saturdays, the game plan was to get there before 5pm, ahead of the dinner crowd and hope for a table around 6pm. Got our names down at 5:30 and got seated at 7pm - even better. We were a bit giddy. Partly because we finally managed to snag a table here without a 3-hr wait, but mostly because we felt so in control - we understood the menu. The items didn't seem alien to us, because we had seen most of them during our time in Sri Lanka. I liked that feeling. So when our server recommended us the Ceylonese spit chicken, we looked at each other with a knowing look, a mutual understanding that a split chicken was not what we queued for, because there were no spit chicken in Sri Lanka. Instead we went for string hoppers and kothu, hopefully the more authentic items as opposed to the 'inspired' recipes. The Masala buttermilk was certainly an acquired taste. It reminded us of the spiced yoghurt drink we had on the posh train to Agra from New Delhi. 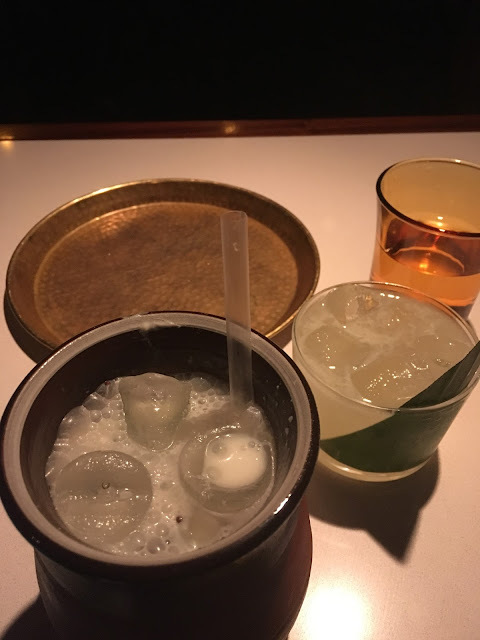 His Sambol Garita cocktail was certainly strong, if not exotic. We didn't rule out all the London-centric items on the menu though. The bone marrow was lick-the-plate-clean kind of delicious. The melty morsels of bone marrow were deeply immersed in a delectable concoction of fragrant masala powder and spices. Even the slightly pasty roti could be forgiven. The string hoppers turned out to be slightly different to what we had anticipated. 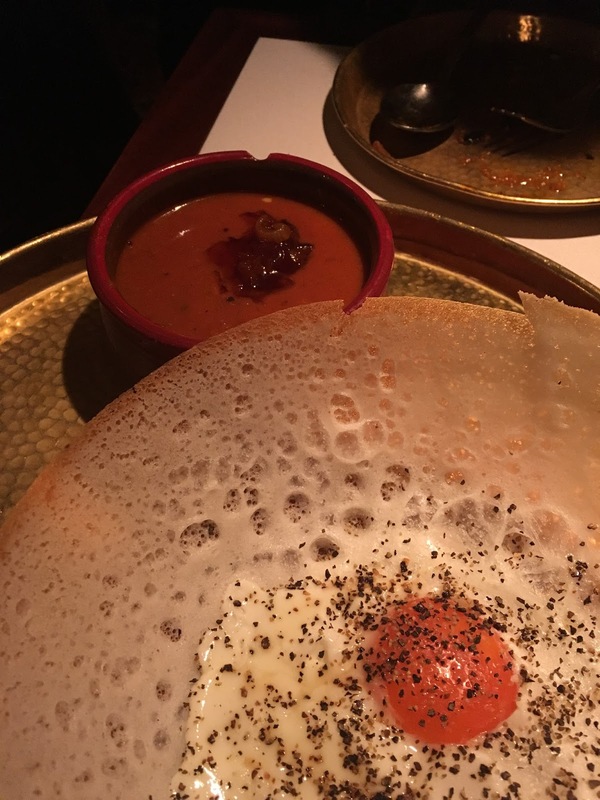 Instead of a soup-like coconut curry like the one we had for breakfast, Hoppers' version had a much thicker consistency that resembled a dip, served with sambal. 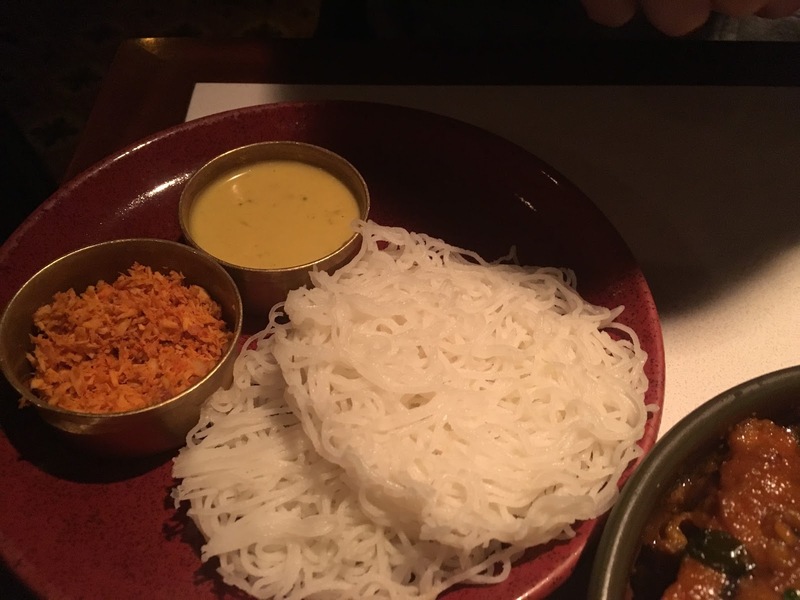 Though the string hoppers were nice and fluffy, we preferred the more watery variety to drown our hoppers in, or perhaps we just needed more coconut curry dip, much more dip. The kothu was excellent; the only thing missing was the racket it makes in the kitchen. The large chunks of lamb were tender and thoroughly marinated with spices, mixed on grill with shreds of chewy roti, onions and eggs. Just like what we had on holiday, but minus the MSG - even better! 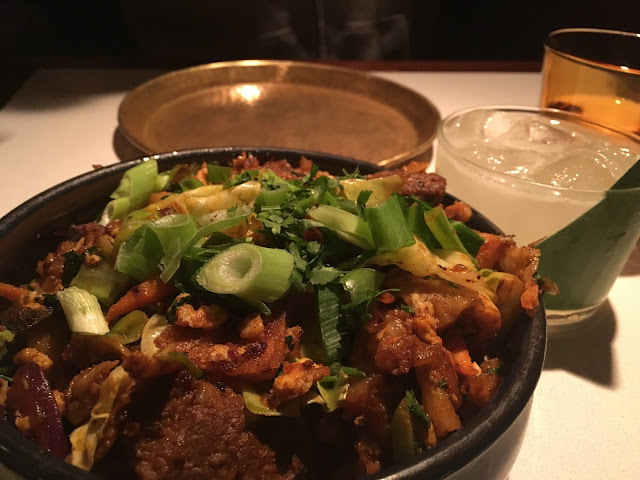 We decided we’d most likely end up ordering this kothu each and every time we came back, definitely more likely than the spit chicken. And yes at that point we had already decided this place was worth waiting in the queue again. 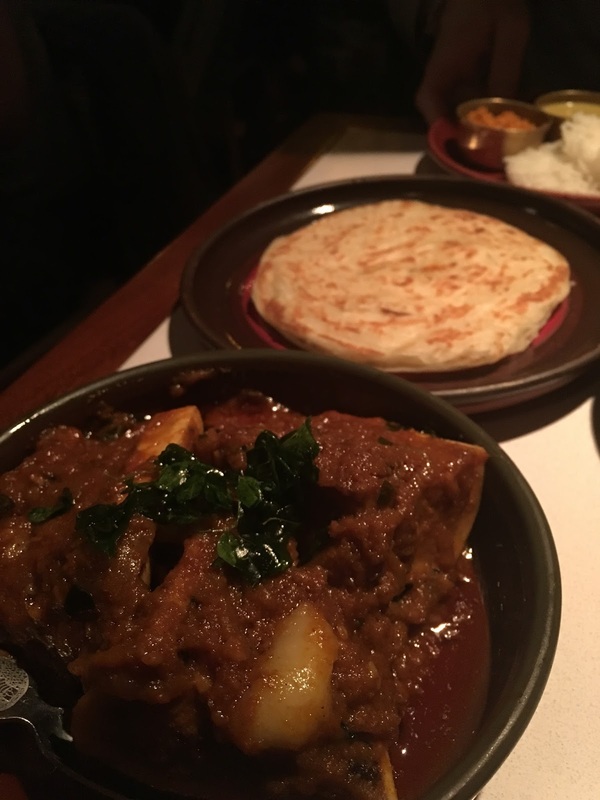 He thought there was almost a 1:1 ratio of lamb and roti... I think he was just very good at picking out the meats. The egg hopper was massive! At least 50% bigger than what we've seen. We debated if it was to cater for European appetites, justify the £4.5 price tag or they just don't have the right utensils (the terrible cynic in me). Most importantly it was thin and crispy around the edge, with a soft and airy centre that held a perfect runny egg. The fish Kari was a bit meh; whilst it was not unejoyable, it wasn't particularly exciting either - just lacked depth and powerful flavours. 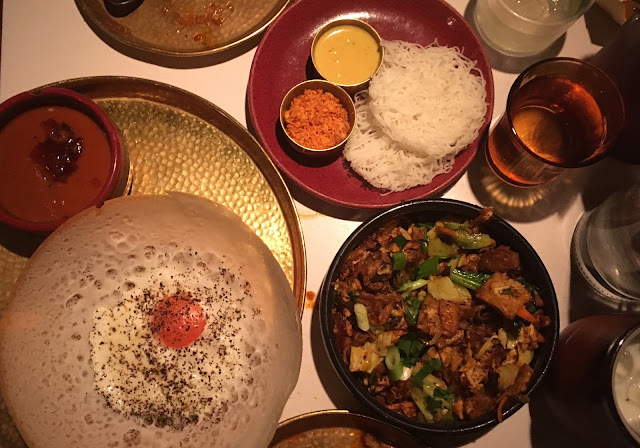 We loved Hoppers - short and appealing menu with unique offerings, supported by a strong kitchen team that's not shy on showcasing the robust flavours in Sri Lankan cuisine. Dishes are slightly tweaked to cater for the London crowd without compromising authenticity. It was worth the 90min wait and we’d stick to the same game plan next time. No restaurant is worth a 3-hr wait.